OXFORD, Miss. 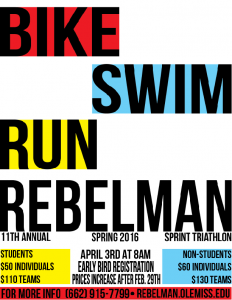 – The 11th Annual Rebel Man Sprint Triathlon is coming up April 3 at the University of Mississippi. Hosted by the Department of Campus Recreation, the event begins at 8 a.m. in the Turner Center. It includes a 440-meter swim at the Turner Center natatorium, 22-kilometer bike ride through the Ole Miss campus and city of Oxford, and a 5.5-K run through campus.